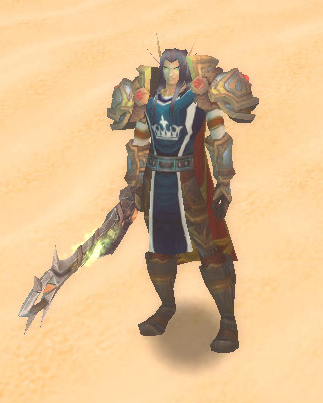 This guide contains: the best talents for leveling (Retribution paladin), what spells to use when « pewpewing », some useful tips so you know how to play your paladin to a better standard, information about heirloom gear links to all class quests, some useful enchants and glyphs as well as some paladin specific addons which will be useful to you. Remember, this talent build is only a « suggestion » but suits the situation of many. You can get it’s full potential by making some small changes here and there depending on your individual situation (gear, damage, survivability, etc.). The best leveling spec for the paladin is Retribution. This is because it has a high damage output while having a minimal mana usage (less downtime). That also means that it is *faster* to level than the other specs. Many would argue that that protection is a better way to level, and I couldn’t disagree with them (because in some cases, it IS). However it is only exceptional when you are leveling with a partner (dps/?healer?) as it allows you to take a large amount of mobs at once, but not to do so much damage to them -> It is slower (due to lower damage) but has got great survivability! For this reason I’m going to write this guide about Retribution as it is the best choice of spec for solo leveling (my protection one will be ready soon). 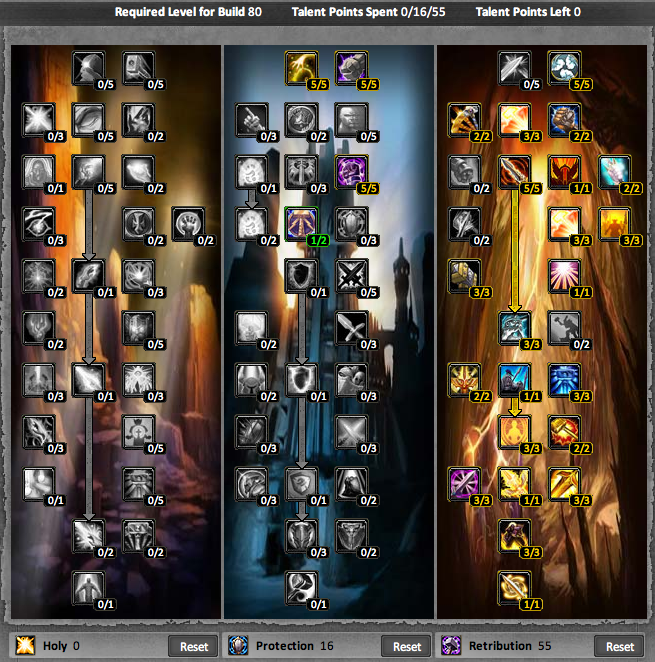 If you prefer to go protection, then go to Paladin Protection 1-80 Leveling Talent Build & Guide (3.3.5) <— Guide. Now… Here comes the hardest part. None of the talents from 72 onwards are especially helpful to us. Some are decent (enough), however, so we’re going to give you some options on what to choose. – Start by ‘turning on’ your first seal, Devotion Aura. – When fighting keep up Seal of Righteousness. – When you get Blessing of Might, once again, keep it up at all times. – When you get Judgement of Light, use when ever available. – Take the best DPS weapon you can; 1H with Shield or 2H. (At this stage the slow weapon is not too important. )Rotation: Auto attack + JoL when possible. Make sure Devotion Aura is ‘turned on.’ Keep the Blessing of Might and Seal of Righteousness Buff on yourself. – When you get Retribution Aura, ‘turn it on’ instead of Devotion Aura. Rotation: Auto attack + JoW when possible. Make sure Retribution Aura is ‘turned on.’ Keep the Blessing of Might and Seal of Righteousness Buff on yourself. – When you get Seal of Command, keep it up when fighting. – If fighting more than 2 mobs use Consecration. – Make sure you are now using a slow 2H weapon. Rotation: Auto attack + JoW when possible. When you are fighting more than 2 mobs use Consecration. Make sure Retribution Aura is turned on. Keep the Blessing of Might and Seal of Command Buff on yourself. – When you get Hammer of Wrath, use it when the mob has less than 20% HP. Your finishing move!Rotation: Auto attack + JoW when possible. Use HoW when the mob has less than 20% HP. When you are fighting more than 2 mobs use Consecration. Make sure Retribution Aura is ‘turned on.’ Keep the Blessing of Might and Seal of Command Buff on yourself. This may seem boring spending all these levels doing basically the same thing, but you’ve got a nice little surprise coming your way! Rotation: Auto attack; JoW and CS when possible. Use HoW when the mob has less than 20% HP. When you are fighting more than 2 mobs use Consecration. Make sure Retribution Aura is ‘turned on.’ Keep the Blessing of Might and Seal of Command Buff on yourself. – When you get Divine Plea, use it when you are low on mana. Rotation: Auto attack; JoW, DS and CS when possible. Use HoW when the mob has less than 20% HP. When you are fighting more than 2 mobs use Consecration. Make sure Retribution Aura is ‘turned on.’ Keep the Blessing of Might and Seal of Command Buff on yourself. Use Divine Plea, when low on mana. – Learn your Resistance Auras. Some bosses do a hell of alot of damage from a school of magic you can protect against. – Remember to buff other party members with your Blessings. Also give the approprite buff: don’t give a Warlock BoM, like-wise don’t give a Warrior BoW. – When healing use BoW on your self. This way you will regain the mana quicker as heals cost a large amount. – Bandages help as well, use this if you have the feeling you are using to much mana (to heal). – Use Hammer of Justice and then use a Heal. – Use Repentence (once gained through talents) and then use a Heal. – Use Divine Protection and then use a heal; or quickly kill the target if it is on low health then heal up. – Skinning/Mining: The best options are Skinning/Mining, since they make lots of money. Skinning gives critical strike rating and mining gives extra maximum health. These bonuses are quite minor and don’t really have any big impact in end-game (they DO give an edge on lower levels). – Mining/Blacksmith: Many plate class players usually pick this one up on at least ONE of their characters, because it allows them to create their own gear. You should try to get the stats in the following order: Strength > Stamina > Intellect > Agility > Mp5 > Spirit > Others. Strength: Needed for Attack Power. Stamina: Needed for additional maximum health. Intellect: Needed for mana, also gives spell critical strike chance. Needed for the heals and other spells. Agility: Needed for Critical strike chance, also gives armor. Mana Per 5 Seconds: You won’t see this much until outland, and that is probably the only place you’ll need it as in Northrend you’ll be using Divine Plea for mana. Spirit: Basically worthless for a Retribution paladin. It speeds up your health regeneration (when out of combat) and mana regeneration (when not casting). Glyph’s…? Have a look here. Click here for a list of Paladin glyphs. PallyPower – It provides you with an interactive and easy to use interface that makes it easier for you to manage your blessings (Righteous Fury, Aura, Seal and Blessing) and automatically check for missing buffs. However it’s true function lies in being able to control assignments of blessings for you and (if you are a party leader or an assistant) for other paladins in your group or raid.